In 2011, in the depths of recession, with the American economy starving, U.S. Rep. Cathy McMorris Rodgers called for the American government to go on a diet. The budget deficit had topped $1.3 trillion, and McMorris Rodgers was warning that America was careening toward a Greek-style debt crisis. "As parents and grandparents, we fear the impact that reckless spending and borrowing will have on the future of the American Dream," McMorris Rodgers said in a 2011 op-ed. "We cannot have a true economic recovery until our leaders get serious about the national debt. Talk to your friends about the debt crisis." This was McMorris Rodgers back when Republicans were deficit hawks, back when they were proposing major overhauls to Medicare and Medicaid. She slammed President Barack Obama's stimulus bill as a "misguided attempt to revive the economy." She called for a balanced budget amendment. Cutting spending wasn't fun, but leadership, she argued, was about tough choices. Today, as Republicans control Congress and the presidency, the economy is soaring. And yet, despite what should be a flood of new tax revenue, the deficit has been climbing back up, jumping 17 percent in a year to reach $779 billion. The Republicans' massive tax cuts last year are estimated to eventually add around $1 trillion to the national debt. Today, McMorris Rodgers is on the other side: She's championing the deficit-ballooning tax cut. She's criticizing her opponent's recession-era budget cuts. And she's charging that Democratic attacks that she wants to cut Medicare or Social Security are flagrantly false. Not only does McMorris Rodgers not see the tax cut as a problem for the deficit — she sees it as part of the solution. 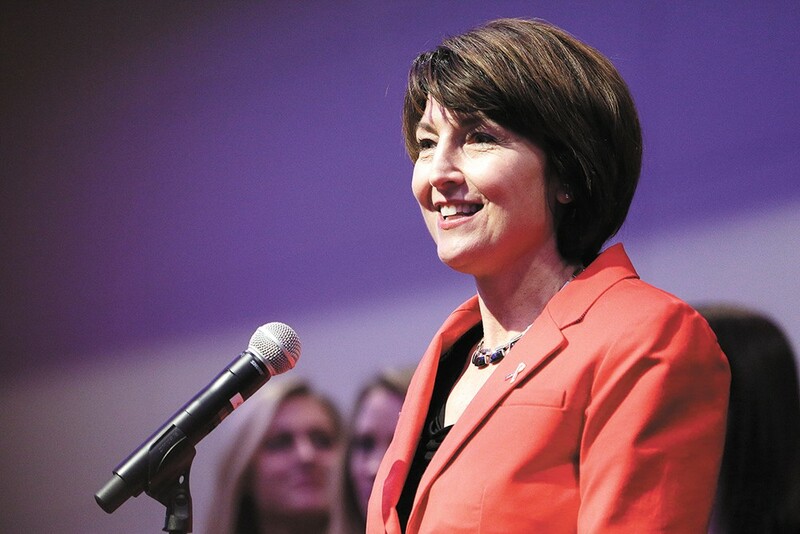 "We have 12,000 new jobs in Eastern Washington," McMorris Rodgers tells the Inlander. "Small business optimism is at a record high. ... Part of addressing our debt is getting our economy to grow." The economy wasn't exactly ailing last year when Republicans passed the tax cut. The unemployment rate was half what it was in 2011. But the rate is even lower today — and other economic indicators are soaring lately. The tax cuts will not only pay for themselves, the theory goes, they'll actually produce so much revenue they'll actually help reduce the deficit. "Corporate tax revenue is up," McMorris Rodgers says, before immediately correcting herself. "No, it's down, it's down. But I believe we will have an increase in the next few years." Economists debate over whether tax cuts produce significant economic growth at all. But the Inlander spoke with multiple national experts on tax policy across the spectrum — including the conservative Tax Foundation — and they all came to the same conclusion: Tax cuts don't pay for themselves. Twice this year, the Inlander has asked McMorris Rodgers to cite an example of a tax cut fully paying for itself through economic growth. Both times, she came up empty. Democrats, on the other hand, have a theory: They believe that Republicans will use the deficit — driven in part by their corporate tax cuts — as an excuse to cut social services. The rich get more, the poor get less. So when Senate Majority Leader Mitch Mcconnell blamed ballooning Medicare, Social Security and Medicaid costs for the budget deficit, Democrats pounced. McMorris Rodgers says these kinds of cuts are not on the table. "Let me be crystal clear: I do NOT support cuts to Medicare or Social Security," McMorris Rodgers said in a recent tweet. "[My opponent] Lisa Brown is using an age-old scare tactic long championed by Democrats." And yet, that budget McMorris Rodgers urged everyone to support in 2011? It attempted to radically overhaul Medicare, transforming it into a system where the government would give vouchers to senior citizens, and encourage them to shop for insurance on the public market. As recently as last year, McMorris Rodgers was celebrating the Congressional Budget Office's score for the Republican's health care bill, noting that it would result in "major entitlement reform, capping Medicaid spending for the first time, saving taxpayers $880 billion." Today, however, McMorris Rodgers shies away from even calling for major cuts to Obamacare. This summer, McMorris Rodgers condemned the Justice Department's refusal to defend Obamacare's pre-existing conditions guarantees from a Republican-led lawsuit. And when the Seattle Times asked her three times this week whether she still intends to repeal Obamacare, she wouldn't answer directly. McMorris Rodgers says she still believes cutting spending is necessary to address the deficit. But she's vague about which program she'd cut. Instead, she calls for consolidating bureaucracy, like the hundred or so federal government job-training programs. She calls for giving states more "flexibility," in the hopes that they'll find new efficiencies without cutting services. "I believe there will be savings, but I'm not just about going in and taking a hatchet to the federal government," McMorris Rodgers says. "As the debate moves forward, there will be politicians who will try to change the subject. They will ignore the debt," McMorris Rodgers warned in her 2011 op-ed. "They will focus exclusively on the spending cuts. Every single cut." But today, McMorris Rodgers is using spending cuts as a cudgel against Brown: She slams Brown for the Washington state spending cuts the state Legislature made during the recession: McMorris Rodgers slams Brown for cutting Washington state higher ed funds, for failing to fully fund K-12 education and for supporting tax increases. "It's about priorities," McMorris Rodgers says. But when pressed on what, exactly, should have been cut instead, McMorris Rodgers can't identify anything. The original print version of this article was headlined "Cutting Both Ways"